A lovely simple card made with the Faye Whittaker CD from Joanna Sheen. I am going to enter this into the Remember When challenge on the Joanna Sheen blog. The 3D decoupage is from the CD although I cut if off the background and used some backing paper from the same CD as the backing. The frame is made using the Spellbinders Curved Rectangles die, I also used the Spellbinders Grand Large labels die to cut the backing paper. 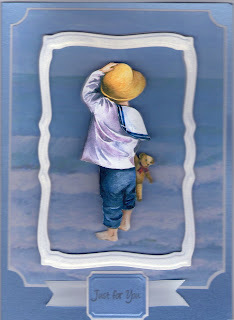 That is such an evocative image and you have made a beautiful card with it. Love the simplicity of the design. Thank you for joining us on the JS Challenge.